Kolkata: Jadavpur University is all set to give the college goers of Kolkata the taste of the first ever Harry Potter event in the city. Alohomora: Unlock the Magic, a two-day event for the Potterheads of the city, has been designed to indulge in fun and soak in the Pottermania. The students of the University have an agenda, very much like Harry Potter and his friends had in J. K. Rowling’s series. The event was born out of the need to analyse and express Harry Potter in the context of the endangered freedom of the educational institutions and of the people of India as a whole. They have even launched the Daily Scribe, the paper presentation event, which aims to highlight the issue of witch-burnings and witch-lynchings throughout history, and the intervention of government in the education system and its representation in the magical world as a reflection of our modern society. Shutters, a photography competition, as part of the event aims to provide a platform to emerging photographers, as a means of expressing themselves, and what they perceive as magic. However, the event has been specifically designed to highlight the intervention of the authorities in the autonomy of an educational institution and destroying the hegemony of the political power that lies with the privileged few in the country today. Prisoner of the Azkaban will be screened to showcase the inspiration behind Alohomora. 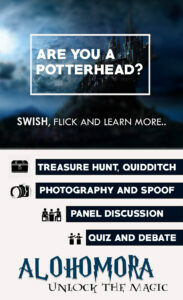 To add more vigour to the event, Quizzitch – quiz for the Potterheads, The Warlock’s Quest, a simulation of the eponymous Triwizard Tournament in Harry Potter and the Goblet of Fire and a Quidditch match for the muggle players who have been disappointed at the lack of a Hogwarts acceptance letter and a way to play the best sport in the world. 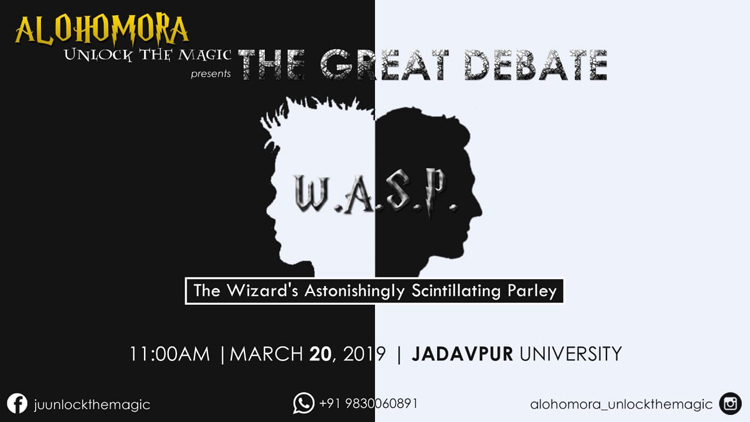 So, if you are a Potterhead, dreaming of bringing about a change in the world around you, feel free to walk into the world of magic being recreated at JU on March 19 and 20. Just remember to say Alohomora, for the magic to unlock!